The Global Volcanism Program has no activity reports for Sand Mountain Field. The Global Volcanism Program has no Weekly Reports available for Sand Mountain Field. The Global Volcanism Program has no Bulletin Reports available for Sand Mountain Field. 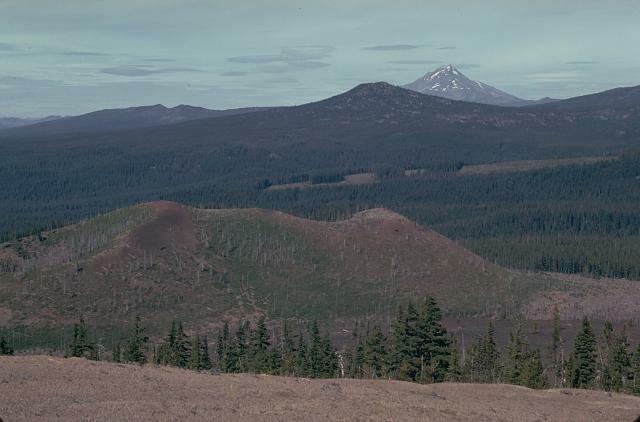 The Sand Mountain volcanic field consists of a group of 23 basaltic and basaltic-andesite cinder cones along a N-S line immediately west of the Cascade crest NW of Mount Washington. Two cone alignments trending NNW and NNE intersect near the largest cinder cone, Sand Mountain. Although previous radiometric dates spanned a wide range of more than a thousand years, tightly constrained paleomagnetic ages imply that at least 13 eruptive units were emplaced in a relatively short period of time about 2950 years ago lasting at most a few decades. The Jack Pine vent at the northern end of the volcanic field is compositionally distinct from the rest of the volcanic field and is considered to have been erupted about 4000 years earlier. Lava flows traveled predominately to the west, blocking local drainages and forming several small lakes. Sherrod D R, Taylor E M, Ferns M L, Scott W E, Conrey R M, Smith G A, 2004. Geologic map of the Bend 30- x 60-minute quadrangle, central Oregon. U S Geol Surv Map , I-2683, 1:100,000 scale and 48 p text. There is no Deformation History data available for Sand Mountain Field. There is no Emissions History data available for Sand Mountain Field. The Sand Mountain volcanic field contains a group of 23 cinder cones erupted along a N-S line NW of Mount Washington. Two cone alignments diverge at the highest cone, Sand Mountain; this view looks along the NNE alignment, with Mount Jefferson visible in the distance. The Sand Mountain cones and associated lava flows were erupted between about 3000 and 4000 years ago. Nash Crater cinder cone, viewed from Little Nash Crater to the NW, is part of a cone alignment that diverges to the NNW from Sand Mountain. Lava flows from Nash Crater were erupted about 3850 years ago and traveled to the west, where they blocked a stream drainage, forming Fish Lake. 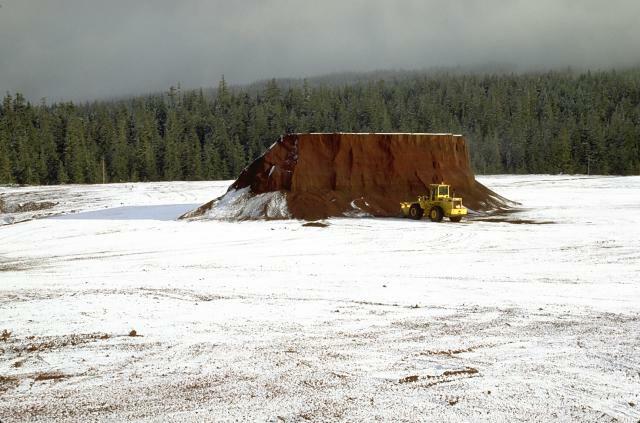 The flattened snow-covered summit of Little Nash Crater, a scoria cone of the Sand Mountain volcanic field in the central Oregon Cascades, has been extensively quarried to provide aggregate for highway construction. Reddish, oxidized scoria from Little Nash Crater can be seen in road surfaces in the Santiam Pass area. A blocky lava flow, still largely unvegetated, was erupted about 3850 years ago from Nash Crater in the Sand Mountain volcanic field of the central Oregon Cascades. This and contemporaneous lava flows blocked local drainages, forming Lava Lake and Fish Lake. Sahalie Falls were formed when lava flows from the Sand Mountain volcanic field that were erupted about 3000 years ago traveled to the west, blocking the channel of the ancestral McKenzie River. 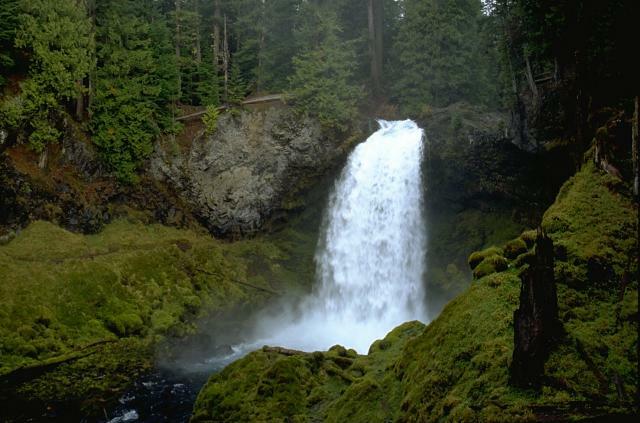 Wind-blown spray from the falls nourishes bright-green mosses that drape rocks around the falls. 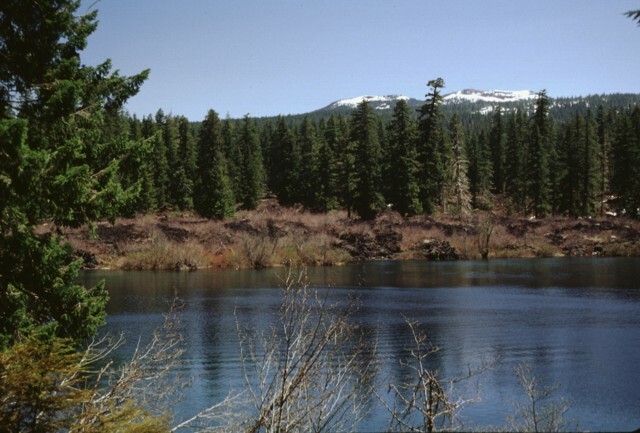 The Lost Lake cinder cones, seen here from the east across Lost Lake near Santiam Pass, are the youngest known volcanic products of the Sand Mountain volcanic field. The cones were formed about 1950 radiocarbon years ago during eruptions along a N-S-trending fissure at the northern end of the Sand Mountain cone group. Growth of the chain of cones blocked Lost Creek, forming Lost Lake. The snow-capped Sand Mountain cinder cones on the horizon were the source of the barren lava flow forming the far shore of Clear Lake. 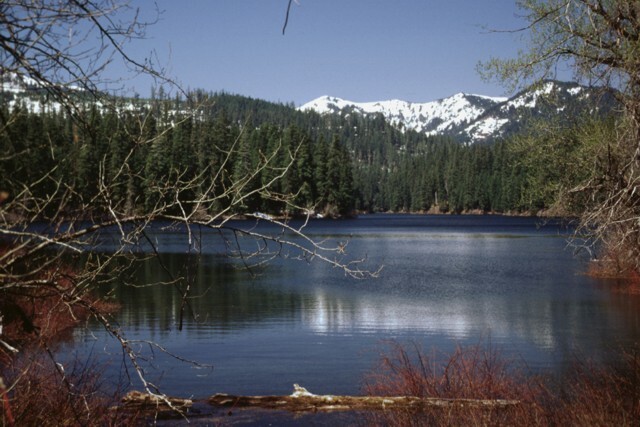 The lake was created when a series of lava flows erupted from the Sand Mountain volcanic field traveled to the west and blocked the drainage of the ancestral McKenzie River. Standing stumps of the forest drowned by the rising lake waters have been radiocarbon dated at about 3000 years ago and are still visible today. 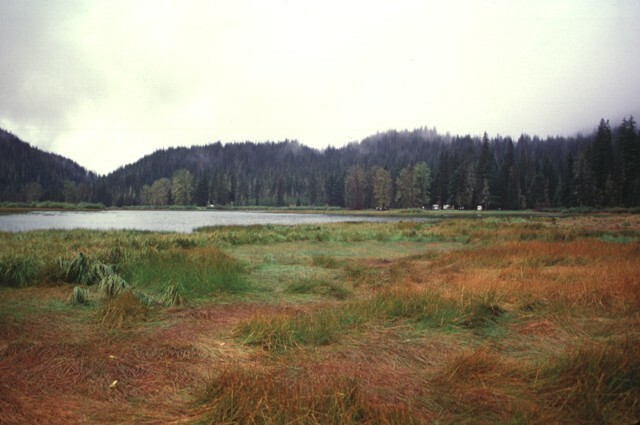 Fish Lake is an ephemeral lake on the western side of the Cascade Range crest that fills with water (as seen here after spring snow-melt) but drys up during the summer. The lake was formed when the Fish Lake lava flow from Nash Crater of the Sand Mountain volcanic field dammed local drainages. This flow and the Lava Lake flow from cinder cones at the northern half of the chain were both extruded about 3850 radiocarbon years ago. 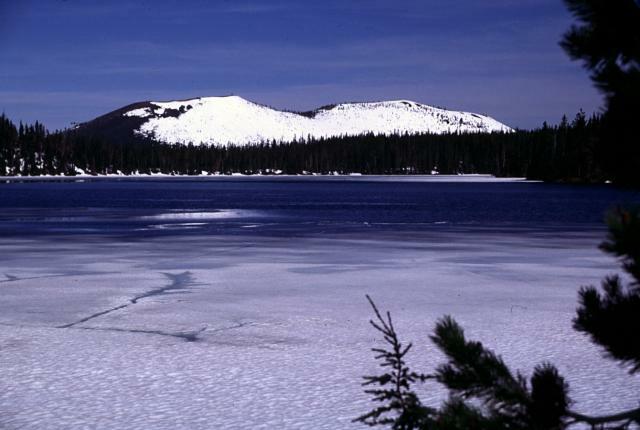 The Sand Mountain cinder cones rise to the WNW in late Spring across the still partially frozen surface of Big Lake. 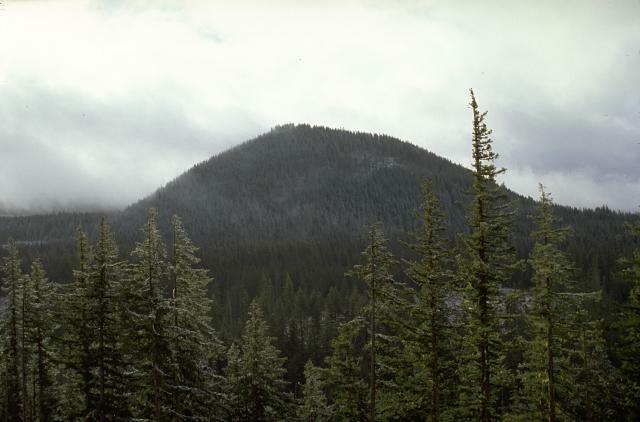 South (left) and North Sand Mountain cones are the largest of a group of 23 cinder cones along a N-S line immediately west of the Cascade crest, NW of Mount Washington. 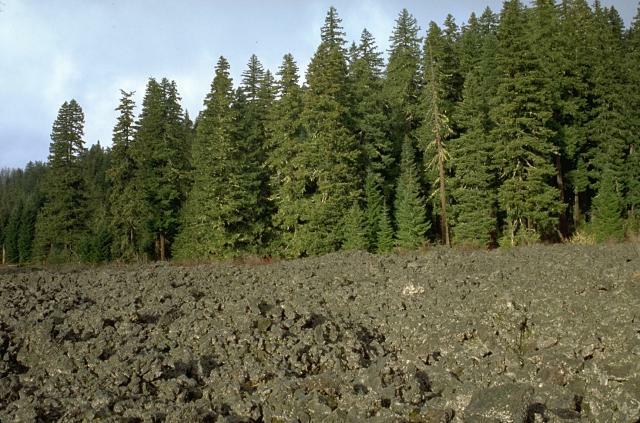 A series of young, sparsely vegetated lava flows reaching the valley of the McKenzie River originated from vents on the west side of the chain of cones and were erupted primarily during a 1000-year period from about 3000-4000 years ago. There are no samples for Sand Mountain Field in the Smithsonian's NMNH Department of Mineral Sciences Rock and Ore collection. Large Eruptions of Sand Mountain Field Information about large Quaternary eruptions (VEI >= 4) is cataloged in the Large Magnitude Explosive Volcanic Eruptions (LaMEVE) database of the Volcano Global Risk Identification and Analysis Project (VOGRIPA).